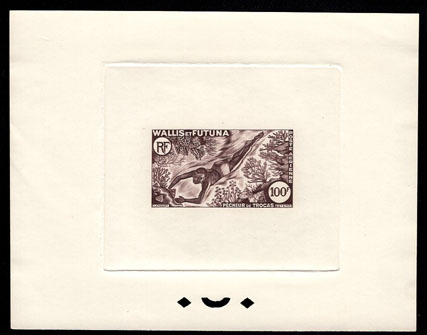 11162 EP WALLIS & FUTUNA (1962) Shell diver*. Scott No C16. Yvert PA19. Sepia Printer's Die Proof. Only 4 copies printed! Rarity! Exceptional exhibit item! 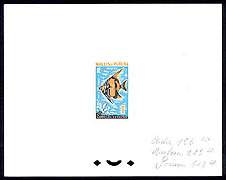 10155 EP WALLIS & FUTUNA (1963) Zanclus cornutus fish*. Scott No J37. Yvert Taxe No 37. Trial Color Die Proof with color codes in pencil. Trial Color Die Proofs for stamps printed by typography are hard to find. Very rare!